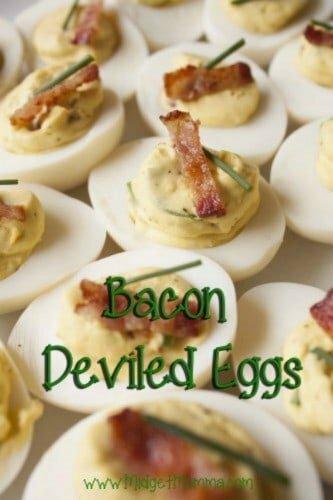 Everyone knows that bacon is awesome and you can add bacon to just about anything and you are making it more amazing then it already was! 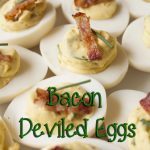 This holds true for so many different things and if you love bacon this is another recipe you can add to your “must add bacon to list” As if deviled eggs were not rich enough I figure why not throw some bacon into the mix! I love the crunchy texture that is added to the creamy egg yolk. These make a great appetizer to any party or just for a fun snack. Place eggs in a large saucepan, add water to cover by an inch. Bring to a boil, cover, and remove from heat. Let sit for 10 minutes than drain the water. Transfer eggs to a bowl of ice water and let cool completely. Halve the eggs lengthwise and remove yolks. Cook the bacon until crispy. Slice one piece of bacon into 24 slices. Chop the remainder of the bacon up and add it to the egg yolks. Mash the egg yolks together with the mayonnaise, mustard, and chopped scallions in a medium bowl. Season with salt and pepper. Place into a medium resealable freezer bag and cut off a 1/2 inch from one of the corners. Pipe the yolk mixture into the egg whites. Top them off with thinly sliced scallions and reserved bacon. Place eggs in a large saucepan, add water to cover by an inch. Bring to a boil, cover, and remove from heat. Let sit for 10 minutes than drain the water. Transfer eggs to a bowl of ice water and let cool completely. Halve the eggs lengthwise and remove yolks. Cook the bacon until crispy. Slice one piece of bacon into 24 slices. Chop the remainder of the bacon up and add it to the egg yolks. Mash the egg yolks together with the mayonnaise, mustard, and chopped scallions in a medium bowl. Season with salt and pepper. Place into a medium resealable freezer bag and cut off a 1/2 inch from one of the corners. Pipe the yolk mixture into the egg whites. Top them off with thinly sliced scallions and reserved bacon. would buy school clothes and back pack with the gift card!